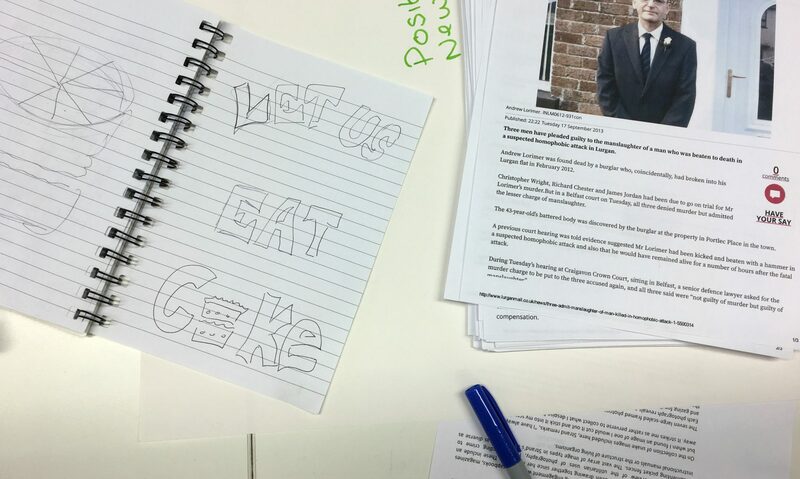 It’s been a week since Let Us Eat Cake opened at Belfast Exposed. The exhibition preview was a great evening with lots of people in attendance and lots of lovely home baked cakes and refreshments. Everyone was very enthusiastic and complimentary about the exhibition and the efforts that went into bringing it to fruition. Holding as little bias as possible about something I have been involved in was easier to do than I imagined. 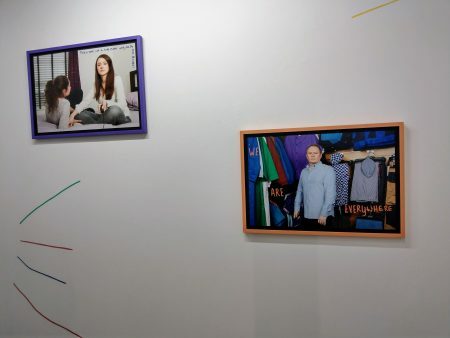 Personally, I am pleasantly surprised by my contribution and how this creatively combines with the other Collaborative Self-Portraits to make a visually impactful display about LGBTQ+ rights in Northern Ireland in the gallery space. I hope readers of this blog will have the opportunity to go along and view the exhibition in situ. It’s the culmination of nine months of discussions, workshops, and collaboration between the participants and Anthony. Each photograph tells an individual story about LGBTQ+ life in Northern Ireland, reflecting a belief, wish, experience or viewpoint that each of us holds dear. I appreciate that we live in a democracy and not everyone may agree with our desire to no longer be denied our fundamental human rights, to be treated as equal to our LGBTQ+ counterparts and non-LGBTQ+ people in the rest of the UK and Ireland. In recent times, positive change could have come about through a majority vote by our democratically elected MLAs. However, our civil rights were thwarted by a ‘democratic’ party through the misuse of the petition of concern. Which in reality shows they have no ‘concern’ whatsoever for those of us whose daily lives are impacted by their bigotry and intolerance. Nevertheless, I do hope that Let Us Eat Cake and my small contribution to the exhibition engages with the public at large and goes some way to raising awareness that we LGBTQ+ citizens will no longer be quietly ignored. We deserve to be treated with the same respect and have the same protection under the law as the rest of the population with whom we reside alongside on these islands. We also positively contribute to society.